*Financing offer valid from February 1, 2019 to June 30, 2019 on select models of new machines manufactured by Caterpillar Inc. Building Construction Products Division only (Mini Excavators, Skid Steer Loaders, Compact Track Loaders,Multi Terrain Loaders, Compact Wheel Loaders, Backhoe Loaders, Small Dozers, Small Wheel Loaders and Telehandlers). Offers do not apply to Cat Utility Vehicles. To be eligible, a signed sales contract and machine delivery must take place during the offer period and cannot be combined with any other offers. Prior purchases do not qualify. Offer subject to machine availability. To receive the financing offer, all balances must be financed through Cat Financial, subject to credit approval through Cat Financial. Financing rate is subject to approval and not all buyers will qualify. Higher rates apply for buyers with lower credit ratings. Final machine prices are subject to change. Offer is subject to change without prior notice and additional terms and conditions may apply. This offer has no cash value and is not transferable. **The cash discount is available as follows: $5,000 on Mini Excavators (303-310), Compact Wheel Loaders (903-914)and Compact Track Loaders; $3,000 on Skid Steer Loaders and Micro-Excavators (300.9-302.7). Cash discounts must be applied to the sale price of the machine at the time of transaction. 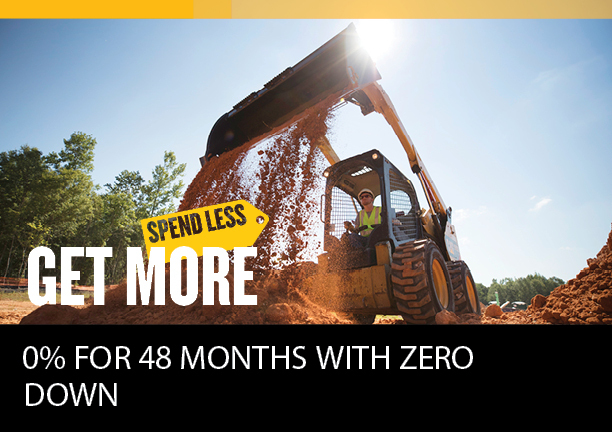 The two-year standard warranty is only available on Cat Mini Excavators, Skid Steer Loaders, Compact Track Loaders and Multi Terrain Loaders.